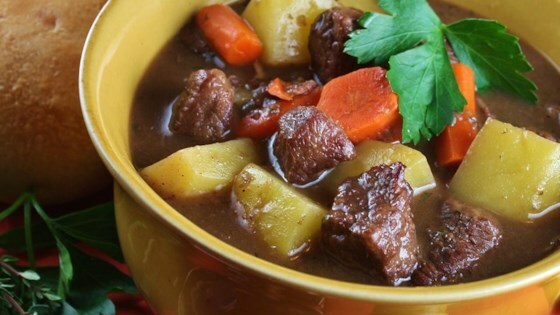 "This is a great comfort food for those cold winter days, and it's great tasting. This is my own recipe. I like to serve it in big pre-warmed soup bowls with salad and French bread." Cook bacon in a large skillet over medium-high heat until evenly browned, about 10 minutes. Remove bacon to a paper towel, retaining drippings in the skillet. Pour olive oil into reserved bacon drippings. Pour flour into a large sealable plastic bag; add the beef, seal, and shake to coat meat with flour. Cook and stir beef in the bacon drippings mixture until browned on all sides, 7 to 10 minutes. Crumble the bacon and add to the skillet. Pour beef stock and Burgundy wine over the beef mixture; bring to a boil, reduce heat to medium-low, and simmer until the beef is tender, about 1 hour. Stir carrots, potatoes, mushrooms, garlic, onion, marjoram, thyme, seasoned salt, salt, and black pepper into the beef mixture; continue cooking at a simmer until the vegetables are tender, 20 to 30 minutes.